Are you tired of scratching your Skin? Is it ruining your summer? This is what I am talking about. " Prickly heat". Prickly Heat is a common problem in summers among children and adults. It is also known as Heat or Hot rashes. In the beginning of summers, the common advertisements we see on Tv channels are about Talcum powders and many more solutions to get rid of Prickly heat. But none tells you or informs you the herbal ways to get rid of this ugly problem. I am sharing a few herbs name here in this write up. You can visit this page to go into details. The skin exposure to unbearable high temperatures in summers causes excessive sweating. This results in clogging of the sweat glands. Instead of evaporating, your sweat gets trapped beneath your skin which in turn causes itching, red bumps and inflammation. 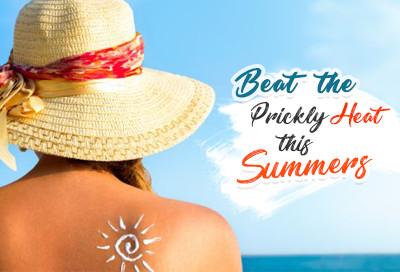 The most common areas of Prickly heat are folds of Skin, Face, Neck, Armpits, Thighs and Groin areas. The reaction may be immediate or red bumps will appear after few days. The symptoms of Prickly heat include red tiny spots on the skin. It causes excessive itching, inflammation and prickling sensation too. Sometimes the red bumps look like small blisters. As compared to adults, children are more prone to get prickly heat as their sweat glands are not fully developed. -Cover yourself completely while going out in hot and humid weather. -Hydrate your body and skin and keep a good intake of water. Apply some sunscreen when you go out. Here are the simple home remedies that are easily available in your kitchen or your kitchen garden to assuage the Prickly Heat promptly. I have shared with you the link to Herbpathy page above, you can visit the Herbpathy page if you want to know more about Prickly Heat, or about the methods to use these herbs for Prickly Heat. Happy Summers to all. !